A group of exiled Morsi-era Muslim Brotherhood politicians based in Istanbul has posted on Facebook a blueprint for overthrowing Egypt's military regime. The Egyptian Revolutionary Council (ERC) reposted several videos on July 31 that it had released on Facebook over the past month offering strategies for violently toppling the government of Egyptian President Abdel Fatah al-Sisi. Sisi rose to power in 2013, after the military ousted Egyptian President Mohamed Morsi and his Muslim Brotherhood-dominated government. Until now the ERC, which met with Obama administration officials and liberal think tanks in 2015, has largely been involved in lobbying against Sisi's government. An Arabic hashtag saying, "Preparing for the Revolution#," appeared on the ERC's Facebook page. The attached videos contain PowerPoint-type presentations with recommendations for Muslim Brotherhood revolutionaries in Egypt. A July 1 ERC video asks, "How do we prepare for the revolution?" Egypt's military holds all of the tools of power, so the video calls for Brotherhood supporters to block military movement to hinder it from suppressing any revolt. "What do we do with the Army?? Like the Turks did," the video says. "Determine the sites of all military units and the roads they use, and the locations of gates to hinder and cripple their movement when they think they are going out to confront the revolution. "Like the Turks did using huge vehicles and deflating their tires to block the roads. We can use heavy oil on the roads to prevent the passage of [armored personnel] carriers like they did in Venezuela." 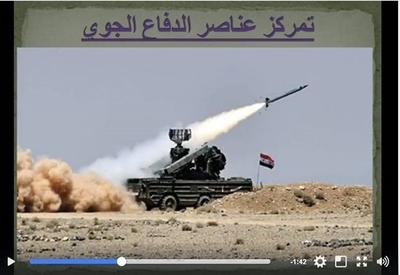 Another video recommends targeting regime military airfields, ground defense units, pilot barracks, spare part warehouses, radar sites, and air defense installations. It emphasizes getting soldiers who either secretly belong to the Muslim Brotherhood or are sympathetic to the group to collect intelligence on pilots and navigators to keep them away from their aircraft. It also suggests gaining intelligence on the types of aircraft used by the Egyptian military and getting information about their takeoff schedules. "The airfields must cease operating in the time of the revolution," a slide says. "Blockading the pilots and preventing them form reaching the airfields is half the victory in the battle." The ERC enjoys little influence or name recognition within Egypt, but its turn toward endorsing violence puts egg on the faces of the Obama administration officials and the liberal intellectuals who embraced them, Hudson Institute Senior Fellow Samuel Tadros told the Investigative Project on Terrorism. "Even the fronts created to talk to the West are now using the language of violence," Tadros said. "The mask has fallen; there's no need to pretend any longer." ERC members used talking points about democracy and the rule of law while speaking in English during their 2015 visit, Tadros said, but those points were noticeably absent when they spoke in Arabic. Other exiled Muslim Brotherhood leaders also have called for violence recently on social media. Senior Muslim Brotherhood leader Ashraf Abdelghaffar called on Brotherhood members to return to the jihadist traditions of the movement's founder, Hasan al-Banna. A "Mujahid Brother" – a Muslim Brotherhood member who wages violent jihad – held the highest place of honor in the movement, Abdelghaffar argued in an Aug. 5 Facebook post. "The only weakness that shall humiliate us is the love of this world and hating death," Abdelghaffar wrote. "Therefore we have prepared your souls for great action. Strive for death - and life will be given to you. Know that there is no escaping death, and it will happen only once, and if you carry it out for the sake of God, there will be profit in this world and reward in the Afterlife, and nothing will harm you except what Allah has decreed. Work for an honorable death, you will be thus granted full happiness. May God provide us and you, the honor of achieving the martyrdom." This thinking, he wrote, reflected Al-Banna's instructions. "Imam Al-Banna talks about elevating the word of Allah and liberating the homelands," Abdelghaffar wrote. "The summit of Islam is Jihad in the Way of Allah." Muslim Brotherhood-linked terrorist groups, such as the Revolutionary Punishment Movement (RPM), Popular Resistance Movement (PRM) and the Hassm Movement, have carried out attacks across Egypt since 2014 – sometimes in conjunction with ISIS Sinai Province. RPM and PRM were founded by Mohamed Kamal, a member of the Muslim Brotherhood's Guidance Bureau who was killed last October in a gun battle with Egyptian police. Kamal's faction of the Muslim Brotherhood executive committee, also known as the "new guard," decided to back away from the group's prior public policy of endorsing peaceful resistance to the Sisi regime, George Washington University Muslim Brotherhood expert Mokhtar Awad noted in a July 26 Hudson Institute article. "Peacefulness is not a fundamental of Islam or the group [Muslim Brotherhood], and special operations work does not mean total confrontation," the book's authors wrote. "'May God grant us and you the honor of martyrdom' ... the Jihadi tendency settled as a doctrine in the foundation of Imam al-Banna's methodology and the acculturation of the Muslim Brotherhood. Until it became a slogan they repeat day and night and on every occasion: 'God is our objective, the Prophet is our leader, the Quran is our constitution, Jihad is our way, and dying in the way of God is our greatest hope." The Jurisprudence of the Popular Resistance to the Coup appeared around the same time as the Brotherhood's official Arabic website, Ikhwanonline, posted a communiqué calling for "a long, unrelenting jihad." Peacefulness isn't a fundamental tenet of Islam or the Brotherhood and that things can change. Magdy Shalash, one of Kamal's top Muslim Brotherhood deputies, told the Turkish-based pro-Brotherhood channel Mekameleen TV. The Brotherhood leadership's espousal of a non-violent slogan after the military toppled President Morsi did not apply to self-defense, he said. The Muslim Brotherhood's old guard, headed by Acting Supreme Guide Mahmoud Ezzat, still talks about peace, but the proliferation of violence and violent rhetoric shows it is losing control of the movement.